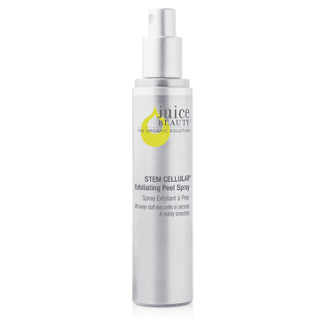 The Juice Beauty Stem Cellular Exfoliating Peel Spray exfoliates immediately to uncover smoother, younger looking skin after just one use. Formulated with a unique gentle plant-derived exfoliant that that resurfaces skin within seconds upon contact, to visibly loosen and liftaway cells. Helps revitalize to reveal a more smoother, softer and rejuvenated complexion. Skin appears plumped, decreasing the appearance of lines and wrinkles. Optimizes skin for serum for maximum anti-wrinkle effectiveness. This product not available in Canada currently. It's ideal for almost all skin types and has been specially formulated to help reduce the look of fine lines and wrinkles. It's not suitable for sensitive skin types. This peel replenishes, restores and renews with a proprietary blend of fruit stem cells which have been infused into an organic resveratrol-rich grapeseed base. It improves luminosity with Vitamin C. Visibly brightens with ascorbic acid and licorice root extract. Soothes with cucumber extract and organic aloe. I love how this peel works on my skin. To apply it, you spray, eyes closed, just a few inches away from your face. Then you let sit for a few seconds and then wash off with a warm wash cloth. Your skin will feel and look amazing. Today I am wearing it letting it go a little longer just to see how long I can tolerate it. I finally had to stop when the itching got pretty bad. AH! Now my skin is so soft that I can claim to be almost as soft as a baby's bottom. This peel, whether used short or of a longer duration (2-3 minutes) is amazing. It really does a number on the skin. The main exfoliant in this product is organic malic acid, which comes from apples. It also contains the anti-oxidant organic resveratrol, as well as organic apple juice, organic lemon juice and fruit stem cells. Juice Beauty can be purchased online at www.juicebeauty.com. Like Juice Beauty on Facebook:https://www.facebook.com/JuiceBeauty; Follow Juice Beauty on Twitter:@juicebeauty; Follow Juice Beauty on Pinterest:https://www.pinterest.com/juicebeauty/; Follow Juice Beauty on Instagram:https://www.instagram.com/juicebeauty/ and Subscriube to Juice Beauty on Youtube:https://www.youtube.com/juicebeauty. Instantly exfoliates to uncover smoother, younger looking skin after just one use. Formulated with a unique, gentle, plant-derived exfoliant that resurfaces skin within seconds on contact, to visibly loosen and lift away old skin cells. Helps revitalize to reveal a visibly smoother, softer and rejuvenated complexion. Skin appears plumped, decreasing the appearance of fine lines and wrinkles. Optimizes skin for absorption of serum for maximum anti-wrinkle effectiveness. This product is unavailable for Canadian Customers.